International Teaching Assistants are (largely) Chinese, Indian, and Korean biology, chemistry, math, and physics graduate students in the U.S. and Canada who are supported by teaching undergraduate courses in their areas of study. In 2010, their numbers increased to 242,061 in the U.S. and they comprised 15.5% of all graduate students. Many undergraduate science, math, and engineering courses are taught by ITAs. Indeed, ITAs make undergraduate education possible, and as instructional faculty are active contributors to the learning of North American undergraduates. ITAs teach in English, which is often their second language. This presents formidable challenges for ITAs’ ability to engage in sustained talk and communication as they explain difficult content and manage classrooms in an educational culture different from their own. 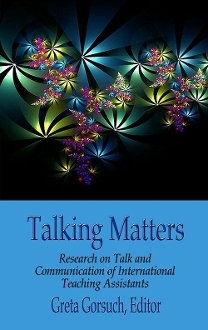 Talking Matters authors take ITA research into new areas using new perspectives with the purpose of improving the communication skills of ITAs and undergraduates, thus enhancing undergraduate learning outcomes. 1. Showcases recent applied research on the professional talk and communication of ITAs, and their interactions with undergraduates. 2. Was developed for on-the-ground use by ITA educators, faculty members in academic departments, and other staff members charged with ITA support. 3. Includes "In a Nutshell" sections which highlight action points that can be taken on the basis of each chapter's findings and recommendations. 4. Provides photocopiable learning materials offered by chapter authors. Native and Non-native English Speaking ITA Performance Test Raters: Do They Rate ITA Candidates Differently? Greta Gorsuch is a Professor of Applied Linguistics & Second Language Studies at Texas Tech University, and has researched educational programs and ITA education for fifteen years. Her publications have appeared in English for Specific Purposes, Journal of Faculty Development, The Journal of Graduate Teaching Assistant Development, and Education Policy Analysis Archives, among others. She edited Working Theories for Teaching Assistant Development (New Forums Press, 2012) and has guest edited special issues of System and TESL-EJ.